Many people have asked me what I regard as the best drum machine. And I’ve waited long to give an answer. Because some might well say that drum machines stand in direct competition with a human drummer. But I don’t think so. Drum machines are great tools for DJs, producers, and drummers alike and they aren’t there to replace anybody. Rather, they invite you to create gripping beats and grooves even without becoming a drummer first. And the good news is: drum machines have come a long way in the music industry since their early days in the ‘80s. Size: The Akai Professional drum pad is a small, yet mighty pad controller. 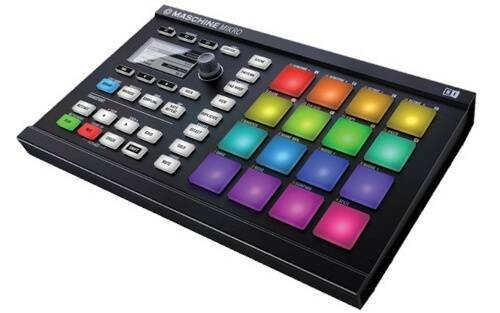 It comes equipped with 48 pad banks perfect for finger drumming and music production. The actual dimensions of this drum pad controller come in at 9.4” x 7.9” x 1.6”. It weighs roughly 1.6 pounds, so it’s lightweight and great for making a drum beat on the go. Performance: If you’re looking for a high-performing drum pad, the Akai Professional has just about everything you need. Once you download the free software it comes with—Ableton Live Lite and Akai Pro MPC Essentials—you’ll be able to create beats like a pro. With its Thick Fat backlit MPC pads, you’ll have the ultimate control. This feature is designed to improve responsiveness to the drum machine user’s contact to the device for more precise control. 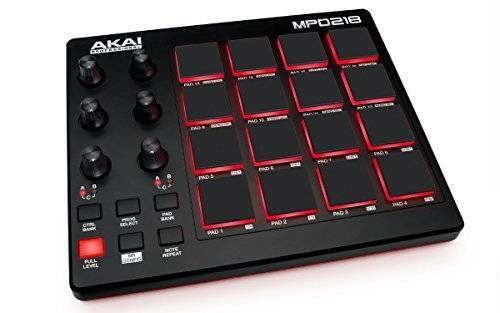 Features: The Akai Professional MIDI Drum Pad Controller comes with a variety of features, all of which I think make it awesome. 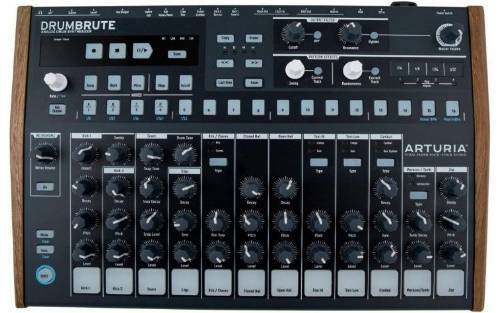 These features include 16 Thick Fat backlit MPC pads, 48 assignable pads accessible via 3 banks, 6 control knobs (which are used to provide input to your drum machine), 18 assignable knobs (which can be assigned to control specified parameters), free software and three banks of available preset sounds and styles to choose from. Size: This Alesis Stereo Electronic Drum Machine is another small machine that is more powerful than its simple design lets on. It comes equipped with 4 audio outputs, 12 pads, and requires AC voltage for power. 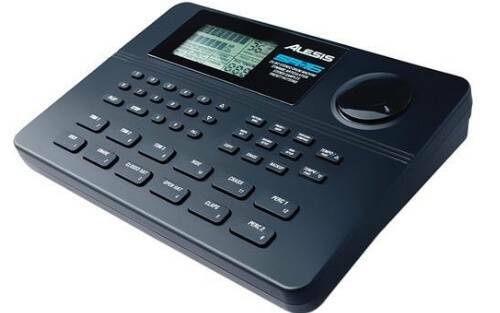 In terms of dimensions, the Alesis is sized 9.25” x 1.5” x 6.5” and weighs around 2.5 pounds. It’s not great for portable use since you can’t run it on batteries and it’s a little on the heavy side. 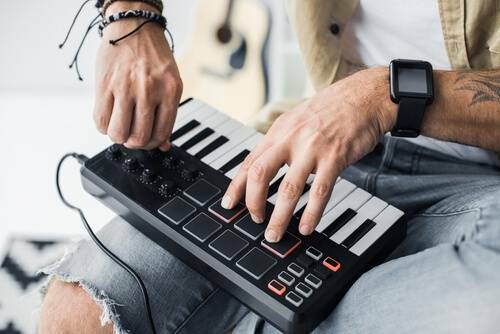 Performance: Whether you’re looking for a machine to help you write songs or accompany you on live performances, this drum machine can do it all. The Alesis likes to call itself the best drum machine ever made and with good reason. It has often been used by songwriters, live performers, and remix engineers as their preferred drum machine. With its 233 realistic and natural drum sounds and awesome digital reverb, this is an incredibly versatile drum machine that allows you to customize your patterns and songs. It’s great for professionals and amateurs alike. Features: The Alesis features an exclusive Dynamic Articulation feature that allows a drum sound to change its tonal when you play it harder for the ultimate in realistic performances. It also features 50 preset patterns that were recorded by top studio drummers, not just programmed in a computer. With its 12 velocity sensitive pads, 8 loudness levels, sound tracking, step editing, stereo samples with reverb and ambiance, you will be making professional sounding songs in no time. Size: The Korg Volca is known for its small size, weighing around 2 pounds and 10.3” x 6” x 2.8”. It’s a medium-sized drum machine that provides all the hits and tricks of a larger one. Although small, the Korg Volca provides a large range of functionality with minimal parameters, makes use of true analog sounds, inspired by old-school rhythm machine and is even equipped with a built-in speaker. Performance: Korg is a trusted name in drum machines. They make high-quality and high-performing machines that have been used by both professionals and amateurs for decades. This particular analog rhythm machine delivers unforgettable classic sounds with six analogue and four PCM-based drum parts. PCM signifies Pulse Code Modulation and is a form of digitalized, uncompressed sound that provides better quality audio. It allows for instant editing via an intuitive user interface so you can easily cut, mix, and slice loops to create awesome beats. To make things even easier, each of the six analogue parts has their own knob for easy editing, and the four PCM parts provide speed control for changes in the pitch. Features: If you’re looking for a wide variety of pro features, the Korg is the drum machine for you. This KorgVolca has a 16-step sequencer, which means that it can store sequences of musical sounds up to a maximum of 16 beats and is inspired by Electribe, a vintage collection of synthesizers, rhythm machines and drum machines created by Korg. This drum machine also features eight memory patches to store your settable parameters and a stutter for glitch or delay-like effects. If you’re interested in production, it even comes with a MIDI In for note entry and external sync and control from your DAW. The best part about the KorgVolca is that you can play it anywhere thanks to its high performing, built-in speaker and optional battery power features. 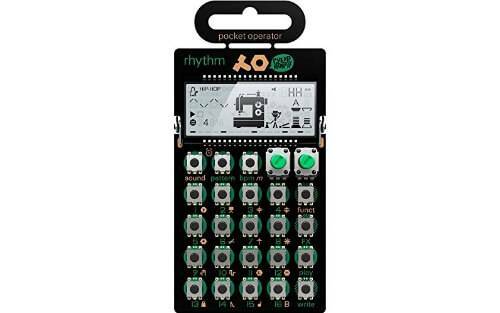 Size: If you’re looking for big performance in a small package, I would recommend the Teenage Engineering PO-12 Rhythm Drum Machine. This mini machine packs more punch than it would appear to, and the size makes it easy to store, transport and even keep with you so you have it in a pinch without ever compromising on sound quality. Performance: Teenage is a small machine power packed with solid sounds, killer effects, and intuitive sequencing. This machine has 16 tweakable drum sounds with a 16-step sequencer that is perfect for creating beats and melodies as well as 16 effects that can be used to alter the sound of the audio source. It produces high quality sound emitted from a Knowles speaker, uses real synthesized drum sounds and has so created a buzz among music enthusiasts as they can use it whenever the need of premium sound arises. AAA batteries power this device and it is so power efficient that a single pair can indeed last for years. The machine also auto-powers off after not being used for 5 minutes. Features: If you are here to find the best drum machine, Teenage is a perfect device. It works great with the tabletop synth rigs because of it being loaded with 16 sampled and synthesized drum sounds. Each of the sounds is further equipped with 2 real-time parameters which match the physical attributes in naturally occurring sound and so, allows Teenage to create realistic sound. The effects library features 16 different effects to alter your drum sounds and allows you to create more varied music. Paired with the 16-step sequencer and 16 patterns this machine will make it simple for you to create entire songs. Size: This small piece of hardware is inexpensive and loaded with features. It is small in size at 14” x 4” x9” and weighs only 0.3 oz., which makes is simple to store and convenient to transport from venue to venue. Performance: Native Instruments offers this awesome pattern based sequencer that gives musicians the ability to easily create songs made up of several short patterns played on a loop. This device is enabled with a high-performance sampler, incredible suite of pro studio effects and instruments, exemplary drum synths and acclaimed sound library in a small package at an affordable price. This drum machine is a total blend of hardware and software and the impressive sound library adds a new dimension and depth to any musical project. This drum machine will help keep you up to date with technology and will give you a leg up on your competition by allowing you to create a variety of sounds and explore your creative side. It is also quite user friendly indeed, for those of us who are not tech savvy, including color coded pads, easy browsing and arranging and improved responsiveness. Great instructions can be found on the website, making this machine appropriate even for the beginner beat-maker. Features: This drum machine will allow you to create your own perfectly tuned drum sounds and the audio is of commendable quality. It comes loaded with 8 GB sound library, which allows you the unique experience of producing a plethora of different sounds for your project, including 11 different instruments and a selection of 25 effects. This drum machine features an innovative tag-based browser that makes navigating the 8 GB sound library easy and is manufactured with 388 multi-sampled instruments, 445 drum kits, 1200 patterns, 8627 samples, 38 projects, and 403 sliced loops for exceptional variety. Thankfully, it doesn’t have any cons so far. People who have used it did not find any disadvantages. Size: If you have been on the hunt for the best drum machine for some time, Arturia Drum Brute may be able to fulfill all your musical needs. It weighs 7.1 pounds with the product dimensions at 20.5” x 12.8” x 3.5”. Although slightly larger and bulkier than some of our other items, this machine is still very easy to store and transport. Performance: This drum machine is sure to give your musical buds a treat. It is enabled with classic drum sounds that are realistic and work well when a drummer is not in fact present. This drum machine is equipped with 17 different drum voices and percussion sounds to achieve a modern sound. In addition, it delivers a rapid firmware updating so whenever an update is available, keeping your technology current is a total no-brainer. Equipped with 11 individual outputs, drum rolls, a global analog filter and the ability to create songs and patterns, this is one of the most versatile drum machines out there. Features: Equipped with a vintage analog sound, this machine sounds as good as even more expensive models offered by big brands. This device delivers a realistic sound at a price that won’t break your budget. This machine operates on an analog signal and the sound is produced using a large selection of snare drum and clap sounds. It also has two different varieties of kick drum sounds and separate settings for tone and decay, which is the way a sound fades from an audible to unperceivable noise. The classic drum sounds are made through rimshot (the sound of simultaneously hitting the rim and skin of a drum to create a beat) and claves (a rhythm pattern). This versatile machine will allow musicians to set the mood, with high quality audio and a wide-ranging sound palette. 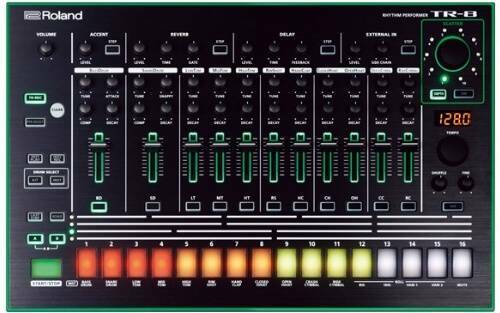 Size: Roland Aira is a great performance drum machine that weighs 6.8 pounds with the dimensions 4.3” x 13.3” x 21.7”. Easy to store and transport between venues. Performance: As the name suggests, this machine can give a new edge to your love for rhythm. The kick drum sounds play nicely and this machine offers sound that rivals even more costly drum machines. This machine delivers big on sound quality and is a great tool for live performances. Besides the small size, the build is solid and durable, which makes it easy for you to carry this drum machine along anywhere. This drum machine is also easy to program, update and its design is logical, with colour coded knobs and buttons, seamless programming as well as everything intuitively feeling like it is in the right place. Features: The Roland Aira is one-of-a-kind and features 16 kits that are made up of 11 different instrument types. It also includes custom dream kits that make use of vintage TR 808 and 909 sounds, which are two vintage Roland rhythm machines, for more versatility. For incredible sound, use the continuous fine and shuffle adjustment knobs that exist to produce custom audio. Dedicated knobs also control the intensity and volume of this machine. This Roland device will also help you remember your youth as it produces great sound for electronic and techno beats. In my opinion, the Alesis Stereo Electronic Drum Machine is the best drum machine for live performances. This machine is versatile, portable and a great tool to use during your live performances. As this drum machine produces classic, realistic sound and provides high quality audio regardless of venue size, many singers, celebrities, and songwriters have used this machine. This piece of hardware also allows you to unleash your creativity and create your own patterns and songs using the 233 realistic and natural drum sounds. The digital reverb of this great machine makes it an all-rounder in terms of performance and will allow you to produce fantastic sound in large or small venues. A drum machine nowadays is a super product if you are a music lover. A drum machine can truly be a lifesaver when a live drummer isn’t around to keep the rhythm. Must be equipped with dual power supply. For example, your machine may be able to run on battery or plugged into an electrical socket depending on your needs. As a beginner, don’t invest in an incredibly expensive drum machine right off the bat. Rather, look for a user-friendly model with multiple sounds and a variety of effects. I hope that this article will steer you in the right direction when selecting the best drum machine to create your perfect sound. 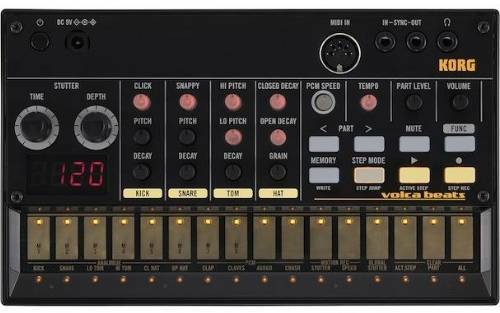 Have you tried any of these drum machines yourself? Did we miss any great ones? Do you have any questions left? Let me know in the comments below! I’ll reply 100% of the time! Great article and information on current drum machines. Thanks. What do you think of the Akai MPC Live for a beginner? Thanks for your question! I think the MPC Live is a wonderful machine – I only didn’t include it as it’s a bit more pricey than the ones reviewed here. Anyway, you can see what you can do with that machine here. Sure! I think this tutorial is really good for beginners and should give you plenty to practice and try out for the first few weeks.